Our Brewers Decorator Centre is a vibrant branch, full of energy and enthusiasm. We’ve a lot of product knowledge and experience between our team and we’re keen to share it with our trade and retail customers whenever it’s needed. Inside, you’ll find the usual array of paint brands for most purposes, a large choice of wallpaper books, and all the decorating tools, accessories and equipment you’ll need. We can also arrange site visits to give tradespeople onsite product advice and local delivery. 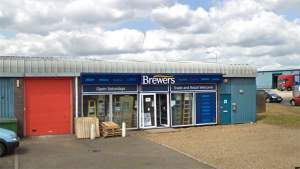 Brewers Decorator Centre Thetford is a short drive from the town centre or the A11, via the A1066 Mundford Road. We’re next door to the TNT depot where St Helens Way meets Lodge Way. There’s customer parking right outside where you can load up the car or van. Travelling eastbound on the A11 London Road, at the roundabout, take the first exit on to the A1066, then the first left on to Wyatt Way. At the end of the road turn left and then immediately right on to Lodge Way. Follow the road round to the right on to St. Helens Way and the store is on the right. From Howlett Way, turn right on to Lodge Way and follow the road round to the right on to St. Helens Way and the store is on the right.